Preparing the children to receive the Sacraments of Reconciliation and First Holy Communion is the joint responsibility of all members of staff and Father Simon our parish priest. We have very strong links with our parish community and photographs of the children are displayed in Church throughout the year so that parish members know who they are praying for. The programme begins in the second part of the autumn term with a workshop for all Year 3 parents. This workshop is led by the RE leader and is an opportunity to reflect on the Sacrament of Reconciliation, what it means and what it entails. The children will then make their First Confession during the season of Advent. At the end of the autumn term the children will then be presented with their certificates to mark receiving the Sacrament of Reconciliation. The programme continues in the spring term when the children will lead the Liturgy at one of our Family masses thus demonstrating a clear commitment to prepare thoroughly for making their First Holy communion later in the year. The preparation for receiving Holy Communion has many facets, lessons in class, school Masses and parental workshops all enable the children to get ready for their First Holy Communion. The day of Holy Communion is the most important day in the school year. A day when the whole school comes together to celebrate receiving Jesus for the first time. The children will later be presented with their certificates towards the end of the school year when they can be congratulated on making their First Confession and First Holy Communion. 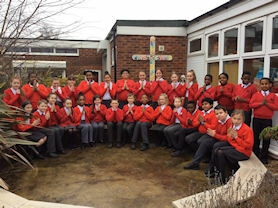 During their final year at St. Margaret Mary's the Year 6 children are prepared to receive the Sacrament of Confirmation. The programme traditionally begins in the spring term when Year 6 visit St.Chad's Cathedral. We have a guided tour of the Cathedral and stay and celebrate Mass to mark the beginning of our journey. 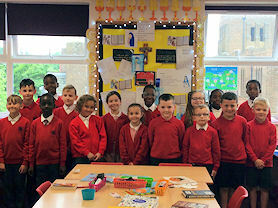 The children are prepared following a school based programme with weekly lessons recommended to us by the Archdiocese. This programme looks at all different aspects of the Sacrament, the symbols of Confirmation and what they mean, its links with other Sacraments and what it now means to become grown up members of the church. The summer term sees the children receive a visit from the Bishop in school, when he will meet them and ask questions of them making sure that they are ready and prepared. The evening itself is a great celebration with the whole school family coming together to mark the Confirmation of our Year 6 children.